We will make your birthday celebration an unforgettable experience for all the right reasons! We have luxury birthday limo sedans and SUVs to match the style and requirements of whatever celebration you have in mind. Maybe you need to transport the whole gang to a party site. We’ve got high-capacity stretch limos and luxury sprinters for that. Check out our Porsche Panamera with Gull Wing Door that seats 8-10 people. This is by far this is the most exotic limo in the Northern Virginia area. For larger birthday parties and the ultimate birthday experience, consider our Stretch 2 Hummer limos and limo party busses. Regardless of which birthday limo rental you choose, we’ll add a touch of class that will make your day unforgettable. The Ultimate Birthday Limo Amenities! 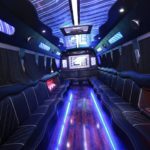 The lighting of our birthday limos is unmatched including a color wash, fiber optic lights, illuminated floor/ceiling lights, laser lights, strobe lights and neon lights. Awesome sound system with sub woofer and Bluetooth capabilities. We’ll Take The Scenic Route! In addition to escorting you to your birthday celebration, we can include a sightseeing limo tour of DC or Northern Virginia. Our chauffeurs will customize the trip based on your preferences. We know that limo safety is the #1 priority for all groups, but especially when children are involved. We want the fun to continue without incident, and our chauffeurs understand how sugary snacks can impact children’s behavior and we will watch them closely. Safety is of primary concern with all of our Northern Virginia birthday limo rental packages. Every week, we provide awesome “Sweet 15” (Quinceañera) and “Sweet 16” limo service celebrations for our customers, along with 21st and 50th birthday limo transportation. 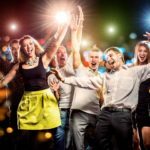 For adult birthday parties, we provide luxury limo transportation service to local wineries, a night on the town , or an evening at the casino with your stretch limo waiting outside. Give us a call or submit the Click For A Free Quote form to learn more. We’re ready to make your birthday celebration the best ever!